SEOUL (Yonhap) – A South Korean consortium signed last week deals with Turkmenistan worth $4.8 bln as their leaders held their second summit in more than a year. Turkmenistan President Gurbanguly Berdimuhamedov held talks with South Korea President Park Geun-hye on April 13 in Seoul to enhance bilateral cooperation in the oil and gas as well as other economic sectors. South Korea and Turkmenistan have focused on the diversification of economic cooperation through the enhancement of energy and financial cooperation, and trade and investment regulations. The consortium led by Hyundai Engineering Co. and LG International Co. inked a $940 mln deal with Turkmenistan to modernize the Central Asian country’s oil refinery infrastructure. The deal is designed to construct facilities that remove sulfur from gasoline and diesel produced by plants located 500 km northwest of its capital Ashgabat. 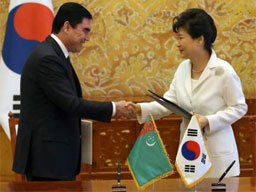 The consortium also signed a heads of agreement with Turkmenistan for another facility. The $3.89 bln plant will produce naphtha by processing natural gas near the capital city. South Korean President Park Geun-hye and her Turkmen counterpart Gurbanguly Berdimuhamedow observed the signing of the two deals after their summit talks at the presidential office in Seoul. It is Berdimuhamedov’s second visit to South Korea following his first in November 2008. It is also the second summit meeting between Park and Berdimuhamedov following their first during Park’s state visit to Turkmenistan in June 2014. South Korea has been pushing to secure lucrative projects in Turkmenistan, which holds the world’s fourth-largest natural gas reserves. Trade volume between the two countries stood at $193 mln last year, up from $141 mln in 2013.